Today, Commonwealth, State, Territory and New Zealand Ministers responsible for fair trading and consumer protection met in Melbourne, Victoria. The Hon Michael McCormack MP chaired the Forum in the absence of the Hon Marlene Kairouz MP. CAF’s objective is to provide the best and most consistent protection for Australian and New Zealand consumers through its consideration of consumer affairs and fair trading issues of national significance and, where possible, development of consistent approaches to those issues. Consumer Affairs Ministers discussed the outcomes of the Australian Consumer Law (ACL) review completed by Consumer Affairs Australia and New Zealand (CAANZ) in March this year. Ministers thanked officials for their work on the review, noting its comprehensive and broad ranging nature, the extensive nationwide consultation and the comprehensive nature of the proposals in the final report. 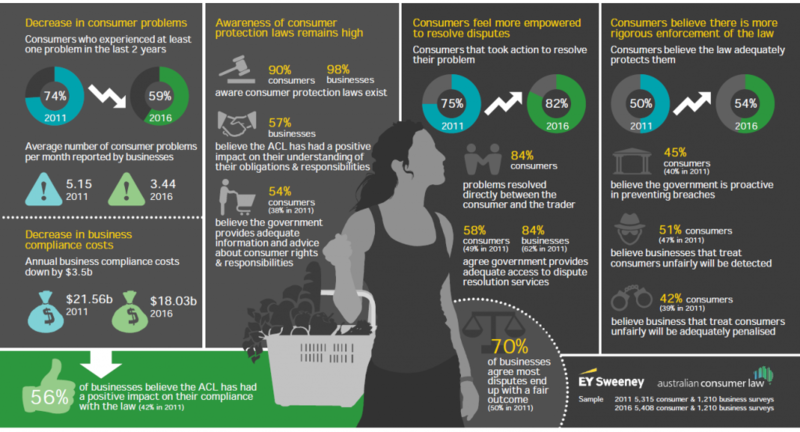 Ministers noted that the introduction of the ACL in 2011 has helped empower consumers, lower business costs and reduce the number of disputes, as demonstrated by the Australian Consumer Survey, summarised in Attachment A. Ministers welcomed the opportunities identified in the report to improve and enhance the consumer law. noted that consumer law regulators will publish guidance as soon as possible to clarify the existing law on three topics and explore options to streamline regulatory processes. agreed to 15 proposals to make minor amendments to the ACL to improve its operation, and expressed their desire that the relevant legislation be put in place as soon as possible. Ministers identified as a priority the proposal to increase the maximum penalties available under the ACL. supported public regulatory impact assessment of seven proposals to amend the consumer law and to report back to CAF in August 2018 for subsequent decision. further consultation on the proposal to introduce a general safety provision, including design and implementation issues. directed CAANZ to place seven research and policy projects on the forward work program and 2018-21 Strategic Agenda, noting the importance of stakeholder engagement in ongoing policy development. Details of the proposals considered by Ministers are set out in Attachment B to this communique. Ministers noted that the package of reforms represents a significant body of work that will help enhance consumer wellbeing and help ensure the ACL can adapt to the development of new markets and consumer issues over time. Ministers further noted CAANZ’s consideration of the Productivity Commission’s study into Consumer Law Enforcement and Administration, which took place alongside the ACL review and was released in April 2017. Ministers noted the study’s finding that the co-operative ‘multi-regulator’ model of enforcement is operating effectively and that several of the findings and recommendations of the study were considered as part of the ACL review. Ministers also noted regulators’ commitment to continuous improvement in areas such as information sharing, communication and coordination, accountability and reporting. Ministers endorsed the 2017-19 National Indigenous Consumer Strategy (NICS) Action Plan for adoption by relevant agencies. The Plan acknowledges that certain business practices continue to affect Indigenous consumers disproportionately, particularly those who live in remote and regional areas. The Plan identifies priority areas to be addressed including door to door trading, scam conduct, housing, consumer directed care, motor vehicles and financial services. Ministers noted that the Commonwealth Treasury will undertake regulatory assessment of ticket onselling with the assistance of CAANZ members. Ministers also directed officials to develop a consumer education campaign as an interim measure to improve consumer understanding and awareness of the secondary ticket selling market. Ministers noted that the Commonwealth Treasury will undertake regulatory assessment of fees for paper billing with the assistance of CAANZ members. Disadvantaged groups of consumers including ageing, Indigenous and regional Australians have some of the lowest rates of internet access in Australia. As Australian businesses increasingly provide bills in digital form, and some charge consumers to receive paper bills, there is a risk that these disadvantaged groups will pay a disproportionate price to receive vital communications. Ministers also directed officials to develop a consumer education campaign as an interim measure to improve consumer understanding and awareness of exemptions from fees for paper bills. Ministers noted recent media reports alleging unfair practices against older Australians in the retirement village sector. Ministers acknowledged that some jurisdictions have recently implemented and continue to move ahead with reforms that will improve consumer protections. Ministers agreed to direct CAANZ to undertake further investigation into the regulation of retirement villages including identifying any regulatory gaps that allow unfair practices to occur. Ministers acknowledged that addressing the conduct of debt management firms will require a coordinated Commonwealth policy approach. Ministers noted the Commonwealth will commence work in 2018 to determine the merits and feasibility of debt management firms coming into the financial services regulatory framework. States and Territories will provide full assistance to identify data to support this work. Ministers also noted a consumer education campaign would be developed as an interim measure to raise awareness of the costs and potential risks involved in using debt management firms and raise awareness of alternatives to debt management firms for consumers. Australian Ministers agreed to support all steps necessary to expedite the regulatory impact assessment process and any other safety measures necessary to introduce a consumer safety quad bike rating system and a safety standard. Ministers noted the progress of key CAANZ national projects over the last 12 months including the consumers with a disability project, music festivals, free-range egg labelling, ‘pop-up’ events and the sharing economy. The Australian Consumer Law (ACL) commenced on 1 January 2011. The first Australian Consumer Survey was conducted by EY Sweeney shortly before the commencement of the ACL and repeated in 2016 to identify trends in consumer and business awareness, behaviour, consumer detriment and business burden in terms of compliance costs. Regulators will work with stakeholders (including tribunals) to provide more specific guidance on both ‘unsafe’ goods and ‘reasonable durability’. Regulators will issue guidance clarifying traders’ mandatory reporting obligations. Regulators will explore options to streamline processes for implementing product bans and mandatory recalls, taking into account findings of the Productivity Commission’s study of Consumer Law Enforcement and Administration. Regulators will issue guidance clarifying the current application of the ACL to the activities of charities, not-for-profit entities and fundraisers. Clarify the mandatory text requirements for warranties against defects by developing text specific to services and services bundled with goods. Clarify the scope of the exemption from the consumer guarantees for the transport or storage of goods where those goods are damaged or lost in transit. increasing penalties for failure or refusal to notify a voluntary recall, proportionate with other ACL penalties. Strengthen ACCC powers to obtain information about product safety, by broadening the power to apply to any person (including a consumer) likely to have relevant information, rather than just the supplier. NOTE: The Chair of CAF will write to the Commonwealth Minister responsible for the ASIC Act to seek their agreement to the amendment. Enable regulators to use existing investigative powers to better assess whether or not a term may be unfair. capture suppliers in their negotiations with consumers where the suppliers obtain, from a third party (sometimes referred to as a ‘lead generator’), a consumer’s contact details or permission to be contacted. Enhance price transparency in online shopping by requiring that any additional fees or charges associated with pre‑selected options are included in the headline price. Amend the ASIC Act to clarify that all ACL-related consumer protections that already apply to financial services also apply to financial products. Ease evidentiary requirements for private litigants through an expanded ‘follow‑on’ provision enabling them to rely on admitted facts from earlier proceedings. if the benefit cannot be determined, 10 per cent of annual turnover in the preceding 12 months. Allow third parties to give effect to a community service order under the ACL. Amend the definition of ‘unsolicited services’ in section 2 of the ACL to allow the false billing provisions (sections 40 and 162) to apply to false bills for services not provided. Amend section 12DC of the ASIC Act to address terminology that is inconsistent with other consumer protection provisions in the ASIC Act and that may unintentionally narrow the scope of the provision. Amend section 76 of the ACL (or the regulations) to clarify that disclosure requirements for unsolicited consumer agreements do not apply to certain exempt agreements. Specify that where a good fails to meet the consumer guarantees within a short specified period of time, a consumer is entitled to the remedies of a refund or replacement without needing to prove a ‘major failure’. Clarify that multiple non-major failures can amount to a major failure. Enhance disclosure in relation to extended warranties. Introduce a general safety provision into the ACL. Apply unfair contract term protections to contracts regulated by the Insurance Contracts Act 1984 (Cth). Modernise the ‘sale by auction’ exemption with regard to consumer guarantees by ensuring the consumer guarantees apply to all online auctions. Increase the $40,000 threshold in the definition of ‘consumer’ to $100,000. Ministers directed CAANZ to place these seven research and policy projects on the forward work program and the 2018-21 Strategic Agenda, noting the importance of stakeholder engagement in ongoing policy development. Commission a third Australian Consumer Survey in 2021 to assist with regular monitoring and review of the ACL. Examine whether the current consumer guarantees are fit-for-purpose for purely digital products, certain market practices and emerging technologies. Promote enhanced collection and dissemination of product safety data, taking into account findings of the Productivity Commission’s study ofConsumer Law Enforcement and Administration and initiatives undertaken by other regulatory regimes. Explore how an unfair trading prohibition could be adopted within the Australian context to address potentially unfair business practices. Undertake an economy-wide study to examine the role, nature and impact of unsolicited selling in the Australian economy, to inform future policy development. Assess the effectiveness of the proposed guidance on not-for-profit fundraising, further regulator actions, and whether any amendment to the ACL is necessary. Review current exemptions, with a view to removing those that are no longer in the public interest.